Hamburg fans look away now: the Allianz Arena scoreboard shows just one of Bayern's big wins over HSV in recent years. We are now counting our way down to the 100,000-goal mark after Bundesliga goal number 50,000 was scored last weekend, and Matchday 22 is sure to put the league on the path to that milestone. 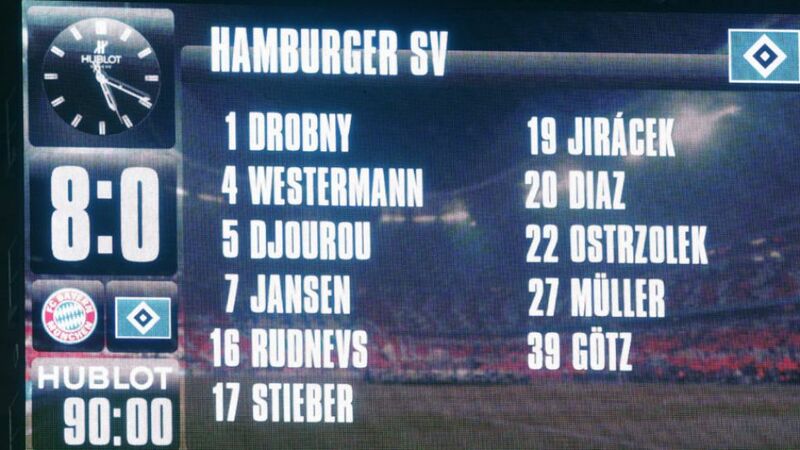 1) Hamburg: Bayern's favourite opposition? Whip your Official Fantasy Bundesliga team into shape in time for Matchday 22 here! A trip to Bayern Munich is generally considered as one of the trickiest days out for visiting teams, and it is not uncommon to hear visiting coaches calling the game a bonus. Spare a thought, then, for this week's visitors Hamburg, for whom matches at the Allianz Arena in recent years has meant damage limitation. Their last six visits to Munich have yielded defeats to the tune of 5-0, 8-0, 3-1, 9-2, 5-0 and 6-0 scorelines; you have to go back to 2008 to find their last draw and 2007 for their last win. Will the gulf be as wide on Matchday 22? Javier 'Chicharito Hernandez is back to his best, and having scored the most Bundesliga goals in 2017, he will therefore be rubbing his hands at the sight of this week's opponents Mainz. The Mexican has particularly fond memories of playing against the 05ers, having found the back of the net five times in his three games against Mainz, including a hat-trick in a 3-2 victory back on Matchday 5. While Chicharito will be happy to see Mainz on the horizon, Borussia Dortmund have a similar love affair with their Matchday 22 opponents SC Freiburg. Since the Baden-Württemberg outfit's 3-1 win in May 2010, there has only been one result in this encounter: a Dortmund victory, with Die Schwarzgelben winning the fixtures 11 times in a row, scoring 35 and conceding just five. BVB will be aiming to extend that run, to both keep pace with the top two in the table and keep a resurgent Freiburg at arm's length. The race for places in Europe next season remains tight, but it could be loosened somewhat by one fixture this weekend. Eintracht Frankfurt are currently a point ahead of Hertha Berlin before their Olympiastadion clash on Saturday evening, and opening up a four-point gap over their rivals is a big motivation for Niko Kovac's side. Hertha, on the other hand, could find themselves level on points with fourth-placed Hoffenheim if they win this one. Just as tight is the battle to avoid the drop and this weekend there are two tasty-looking six-pointers to look forward to. Wolfsburg have been sucked into the danger area and their clash with northern Germany rivals Bremen on Friday night has taken on a real relegation battle character. As for a defeat against Augsburg would leave them 15 points behind their opponents, and at least eight from safety. Finally, Ingolstadt remain second-bottom but will go into their game against Borussia Mönchengladbach with confidence having won at high-flying Frankfurt last week.